Apart from the original cast, Roger Kwok pairing up with Joey Meng, Wong Cho Lam, Ivana Wong, and Louis Cheung, Angela Tong and Bob Lam, and Wong Kwong Leung and Mimi Chu, the sequel has also invited Hins Cheung to take part. The sequel's story and character pairings will be entirely new. The early plan is that Ivana and Cho Lam will no longer be a pair. Cho Lam will be developing a new romantic storyline. On the other hand, while Louis is pursuing Ivana, Hins will appear as a romantic rival, creating a love triangle. Producer Wong Wai Sing: "The sequel will indeed begin filming next year in March. Also planned for Hins; however, because it is still eight or nine months from now, there is still quite a bit of time, so the cast has not been finalized. However, we also want Hins to join. Because [they] are friends, the end result may be even more ideal". - This series has no relations to "Inbound Troubles". - The storyline talks about the happenings within an old building, where the residents are different types of people of different classes. The disparity between the rich and the poor is the selling point. - Roger Kwok will play an environmentalist who is determined to save the earth. Later, he acts as a Korean star. He and Joey Meng are a pair. - Wong Cho Lam will play a rich second generation. He will have a battle between the rich and the poor with Roger. 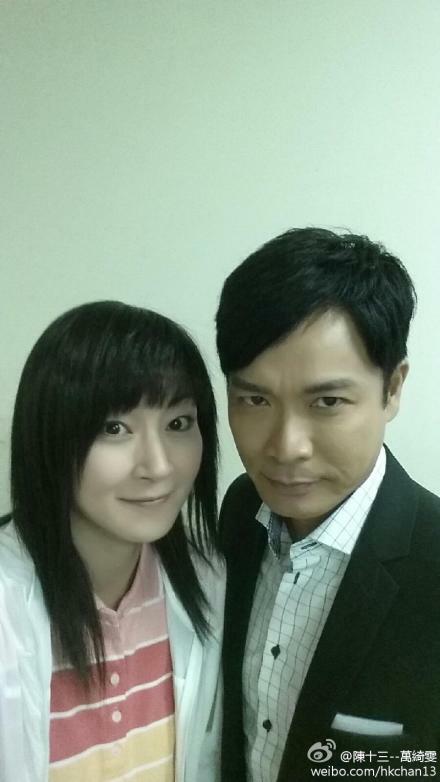 Later, there may be the addition of a father-son relationship with Wong Kwong Leung. - Joey has a dual personality. To the outside world, she is ferocious and frequently yells at people; however, when she is at home, she is a Mama's girl who feels inferior and is extremely ignorant. She will have a romantic storyline with Bob Lam and Roger in succession. She will have a political dating relationship with Bob; however, in the end, she will be with Roger. - Louis Cheung will play a fitness coach. He will not only have a romantic storyline with Ivana Wong, but he will also get entangled with wealthy woman Mary Hon. He does not consider himself a gigolo; he just uses his muscles for his future. - Mimi Chu will play Joey's mother. - Bob will play Kwok Po (郭寶), a politician. He is Joey's boyfriend who has been arranged by her mother. - Angela Tong will seduce Roger. - May Chan and Bob are a pair. - Jimmy Au will play Siu Lung Bao (小籠包). - Leanne Li will play a mean star who was a former beauty pageant contestant. - Hins Cheung will guest-star. Edited by foreverleila, 24 September 2014 - 10:15 PM. Roger Kwok, Joey Meng, and Angela Tong were in TVB City filming a Sales Presentation clip for the second installment of "Inbound Troubles". When talking about the content this time, they said everything has been handled over to Wong Cho Lam to create. Roger expressed that it is an entirely new story...will have a surprise. He portrays a very special character...is a real-life character from the lower-middle class. The challenge greatly exceeds 'Ah Wong' from back then...has a refined and a despicable side...viewers will watch it happily. Will he provide opinions? He said that he absolutely respects the creation...have confidence in Cho Lam. Roger said, "This person is not fictional...is living and existing. Really very surprising!" Roger insisted on not saying too much...leave it to next year's fitting! Joey revealed that her character this time is a big transformation from the first installment. Cho Lam also said that, apart from having partnering scenes with Roger, also arranging an unexpected partner for her, making her greatly anticipating it. Angela said that she does not know what her character is like yet. liked the prequel, hope the sequel will be as good. A bit disappointed that they didn't have an actual clips to show for the sales presentation. But still looking forward to this since I loved the prequel! yea, I thought they have some actual clips on that ... guess not. I also like the prequel, heard it's wong cho lam's script. This time he adds in his gf, Leanne Li. will be looking forward, wondering if there's any romantic line between them in here. Actually really anticipating for this drama to be released! (: Is Wong Cho Lam gonna take part in producing or writing the story again? Edited by casualtvb, 22 March 2014 - 07:22 AM. Joey still looks a million years younger looks good, but ROGER WHAT HAPPENED TO YOU. ARE YOU A HOBO. Yesterday Wong Cho Lam, Roger Kwok, Joey Meng, Ivana Wong, Louis Cheung, Bob, Wong Kwong Leung and Cho Lam's girlfriend Leanne Li attended the blessing ceremony of TVB new series Inbound Troubles II. Cho Lam implied he may add a father-son relationship into the later part of the story. Wong Kwong Leung joked: "The best would be for our story to develop into a broken relationship. I will say again, Cho Lam and I have no relationship. We are not father and son." In the series, Cho Lam plays a wealthy young man who will battle against Roger Kwok's role. He said: "This time, the roles were all tailored to the person in hope to give the audience something they haven't seen before. Just like Roger Kwok, he's very messy looking and Joey Meng is very mean. Leanne, I'm going to keep it a secret. After all, she's a bad person!" When speaking of Joey Yung and Chapman To's fuel? Cho Lam said: "Each of them say one less word! Sometimes when I prank people, I don't know who I've offended. The most important is to apologize. Joey is very generous, she'll be fine after calming down." Roger had long hair and a messy look for this new series. He plays an environmental protection activist and has a mission to save Earth. However, he later gets a whole new image as he pretends to be a Korean star. Asked if he'll look like "Do Min Joon" Kim Soo-hyun? Roger said: "We'll see what the trend is when the time comes." Louis Cheung appeared in a tank top and showed off his muscular arms and tattoos. In the series, he'll have a relationship with Ivana and wealthy lady Mary Hon. What heavy flavor! Louis laughed: "I don't consider myself a duck (male prostitute). I'm just using my muscles in exchange for a career." I've never been one who is into sequels, but this one actually does sound interesting -- I just hope that it will be as good as the first one! The first one was really good and I hope the second one will be even better! The night before, Joey Meng, Bob Lam, and May Chan were filming the new series "Inbound Troubles II" dressed up as Tony Leung and 'Fat and Skinny Maggie Cheung' in the movie "In the Mood for Love". Joey, who was wearing a tight-fitted qi pao, revealed that, in order to wear the costume, she did not dare to eat: "This qi pao is really tight. Wore it immediately after trying it on. Did not even eat...will eat after completing filming". Regarding being despised by Bob in this series, Joey laughingly said that it was very fun: "The storyline is about Bob and May being discovered by me when having an affair in the middle of the night. Afterward, Bob gets upset, despising my figure for being 'absurd', so he wants to break up with me...very funny and very fun. (Have a kiss scene with Bob?) As long as he is serious when kissing, then I can handle it...don't fool around to make me laugh. (Husband complained?) Would not! (Do you have any bed scenes with male lead Roger Kwok?) When the mood comes, let's see!" May appeared in a qi pao and two-inch heels. Every time the cameras stopped rolled, she kept saying that her feet hurt and had to change her shoes, even having to put tissue to ground to end the matter on one occasion. She, who wore a qi pao for the first time, frankly said that she could not breathe: "When I had a fitting, I told everyone that I lost 20 pounds. In the end, a smaller qi pao was made, so now I have to wear a girdle in order for it to work. Can't even breathe, and the buttons keep popping out". Bob, who was on the side, immediately praised her for being hot: "I'm getting a nosebleed from seeing her. Her qi pao look makes the guys smitten with her!" When it was mentioned that Bob is fortunate to be caught in between the 'Fat and Skinny Maggie Cheung', he laughingly said that he obtained May's 'first kiss': "She gave her precious onscreen and real-life first kiss to me!" After hearing this, May immediately complained, "I don't care whom it is with. All in all, must kiss better for the next one". As the screenwriter and male lead of the upcoming TVB drama "Inbound Troubles 2", Wong Cho Lam expressed that he did not set up any kissing scenes between girlfriend, Leanne Li and Louis Cheung. Seems like he still has some hard feelings about Leanne and Louis' passionate kissing scene in a past drama! As for May Chan (Sai Sai Lup) and Bob's bed scene, they joked that the scene will be "real". Yesterday, artists Wong Cho Lam, Joey Meng, "Sai Sai Lup" May Chan (Siu Bo) and Bob, filmed for "Inbound Troubles 2" at Tseung Kwan O TVB City. The supermarket set was built with close to 1,000,000 HKD; looked quite real! As the drama's screenwriter and male lead, Wong Cho Lam revealed that he and girlfriend, Leanne Li, don't have many scenes together, because he was worried that the two will keep laughing during their scenes, but he didn't expect that his girlfriend and Louis Cheung also couldn't bear to laugh during their scenes. Asked if he set up any kissing scenes for the two? He laughed: "Of course I won't! They already had a passionaate kissing scene in another drama before. Let me convince Kay Tse to film too, then it will be me who will kiss her! Siu Bo, in a "Cheon Song Yi" look, expressed that she is actually imitating Vivian Chow. Yesterday's filming scene was about her winning Joey Meng, successfully stealing Bob away. Siu Bo gave her first on-screen kiss to Bob, and the two will also film a bed scene. Siu Bo laughed saying Cho Lam used a lot of effort and finally convinced her to film a bed scene: "Hopefully next time I can get a better partner for a kiss scene! I'm worried about the bed scene, not sure how to film it. Bob is so skilled, he can do what he wants and lead the way then!" Bob joked saying he and Siu Bo will do the scene for real, and will even use his "prized posessions" for reference: "You can see I have three kids already, obviously you can tell I have a lot of "soy sauce discs" at home!" About Joey Meng having kiss scenes with both Roger Kwok and Bob, asked if she has to report to her husband about it? She said: "My husband already expected there will be kissing scenes, small case!" Aside from this, TVB recently reported their primetime ratings for last week. "Journey to the West" and "Never Dance Alone" recorded an average of 22 PTS and 24 PTS respectively, and Sunday's new variety show "The Conquerors" had an average of 22 PTS. Corinna Chamberlain took her "luggage" to TVB city yesterday, getting ready to shoot upcoming new series "Inbound Troubles II". In the series, she plays Wong Cho Lam's bodyguard and she has to be good in fighting. Hence, she has been taking lessons in Wing Chun for a few months. Corinna discovers there are different styles of Chinese Martial arts. She revealed that she is lucky, her Kung Fu master is very gentle with female learners. "I get some bruises during lessons, I don't get a lot of injury though!". Corrina also learned how to do a tie and some classical Chinese languages as some of the scripts are using classical language. He said "Classical Chinese language is new to me, almost a different language, more difficult then learning Kung Fu, sometimes when I watch an ancient court drama, I heard some conversation spoken in classical languages, I often don't understand what they are saying!" Bob took her first kiss; Sai Sai Lup: He was so fierce! Last year's "Inbound Troubles", which Wong Cho Lam took part in screenwriting, revolved around the topic of the conflicts between Mainland China and Hong Kong, attracting a lot of topics within society. Wong Cho Lam continues with the sequel, "Inbound Troubles 2", this time, even playing with the topics of politics and the entertainment industry. Just having started filming, there has already been a lot of attention. Within it all, the one that stands out most is the pairing of Bob and May Chan (Sai Sai Lup). They already revealed from the beginning that they would have numerous kissing scenes. The day before, HK Headline Daily spotted the two filming a passionate kissing scene on the streets of North Point. Although it is Sai Sai Lup's first ever kiss with a man, she still appeared to be very into it, but still not able to take initiative like the very experienced Bob. Sai Sai Lup, who let her partner control everything, said that Bob was very fierce, and even joked that if it was a movie, he would've probably even taken off her clothes. In "Inbound Troubles 2", Bob already has a girlfriend, Joey Meng. The two already filmed a kissing scene earlier, in which Joey praised that Bob's lips were very soft. This time, Sai Sai Lup will play a third party, fighting for Bob with Joey. Their kissing scene that day was about Sai Sai Lup, who plays a masseuse, and Bob not being able to control their feelings and kissed passionately on the streets, after Sai Sai Lup had helped Bob with fire cupping. Other than the two kissing to the point of their heads twisting and noses clashing together, Bob even took off his clothes, showing heart shaped fire cup marks; making the scene although passionate, at the same time, funny. Before filming, Sai Sai Lup had actually disclosed that she has never kissed before, so this time, other than being her first on-screen kiss, it is also her first off-screen kiss; definitely selling it big to Bob. Asked about the preparation they did before filming, Sai Sai Lup had actually ordered Bob to brush his teeth and use mouth wash, "Good thing he was very cooperative. The filming took 3 hours. Whenever he took a break, he would go wash his mouth, so I felt quite at ease." Sai Sai Lup, who has absolutely no experience in kissing, seeing how much initiative Bob took, could only let him take control. "He was very fierce! So I just let him take the lead! If this was a movie, I think he would probably even take off my clothes. It's only because there are boundaries for television, so it wouldn't be able to be broadcasted!" Regarding the fact that her first on-screen AND off-screen kiss have been taken, Sai Sai Lup reinstated that Bob needs to take responsibility, "As long as he gives me a part in all his jobs in the future!" About Sai Sai Lup describing him as "fierce (like a wolf)", Bob laughed and replied: "If I'm like a wolf, then she's like a tiger! She was still very into it even though she has no experience, very worth praising! She made a big sacrifice this time. Although her character is a third party, but she is not nasty at all. She is very cute and like a "jade girl", so her name is called Vivian." About taking Sai Sai Lup's first kiss, Bob honestly said he is sorry: "Actually, this is also my first on-screen kiss. I will take responsibility. If she can't get married within 10 years, I will take care of her forever. I already told my wife about it; she can be like our god-daughter!" (She said to give her a part in your jobs!) "No problem, I'm sure our on-screen pairing will be accepted by everyone." The final scene of "Inbound Troubles II" was filmed at a theme park, and a completion banquet was held afterward. Wong Cho Lam expressed that Roger Kwok has gone to the location he got married back then to perform another wedding, while he himself is only a relative in the series. Cho Lam revealed that he will film an imitation programme after completing this series: "Would also fight for this series to release during the anniversary. There are many competitors! (Which one?) Many. Everyone wants to be the anniversary series, but temporarily looking at various promotional things, and whether public opinion can be handled". Regarding Cho Lam wanting to fight for this series to be an anniversary series, Roger and Joey Meng expressed that they definitely support it. When asked what competitors they knew were fighting to be an anniversary series, although knowing that the schedule has already been set, Roger laughingly said that "Black Heart White Soul", which he has a part in, is a competitor, while Joey laughingly said that her "Officer Geomancer" is also a competitor. "Come On, Cousin" will air after "All That Is Bitter Is Sweet" on October 20th @ 8:30pm. Edited by foreverleila, 12 September 2014 - 10:24 PM. Come on, Cousin will have 30 episodes, no longer 25 episodes, 5 more episodes are added. Anniversary slot. Roger Kwok, Louis Cheung and Leanne Li have a very good year this year haha! Definitely gonna be hyped up. Best Actor, Best Supporting Actor and Most Improved Actress respectively. The cast and crew of TVB anniversary drama "Come On, Cousin!" is the same as the last year's hit "Inbound Troubles", with a whole new story, airing this coming Monday. The pairings are entirely new this time, with the exception of the well-received "new generation" on-screen couple, Roger Kwok and Joey Meng. Wong Cho Lam expressed that he also thinks that this couple is just too compatible, so he did not break them up. The story this time will be revolving around father-son relationships, relationships between neighbours. The cast and crew are still as strong as ever, the laughter is definitely even better than before. Two time TV King, Roger Kwok will be playing an enthusiastic environmentalist, leads protests to help citizens get what they want. He also ends up being a congressman. He and Wong Cho Lam are rivals. Roger Kwok has a big chance at taking TV King again with this role. In terms of love, he will continue a relationship with Joey Meng, but this time, they have to go through a lot of obstacles, and has to fight with strong love rival played by Bob. Joey Meng's character is very extreme, one side - she is like a quail, the other - she is very bad tempered. In the drama, she dates her childhood friend, Bob, set up by her mother (played by Mimi Chu). Until Roger appears and encourages her, she overcomes her psychological barriers for "oranges", and allowed her to understand herself and think about who she really loves. Afterwards, Bob falls in love with Siu Bo, Roger and Joey start dating, and after numerous obstacles, they have their happy ending. However, a "third party", Akina Hong, comes between them, and raises a red light in their marriage. In the end, they save their marriage with secret weapon, Liza Wang. Also, Bob (who has a Kim Jong Un look) and Siu Bo will play a pair. Their images are hilarious, and the two create a lot of comedic moments in the drama, especially the two's shocking bed scene, definitely a scene that will make the audience roar with laughter. Wong Cho Lam's character in the drama is completely different compared to "Inbound Troubles". This time, he will play an vulgar rich kid, who wants his father (played by Wu Feng)'s fortune. He bullies supermarket and TV station's employees, very rude and unlikable. He also created a new "cousin accent", which many praised him for his "language ability". Other than deleting his own scenes and letting other characters show their talent, he even gave up "his love", Ivana Wong (from Inbound Troubles) to Louis Cheung, letting the two continue their "fate" from before. However, Cho Lam is not lonely in this drama either, as he has Siu Yee (guest star), who plays the richest family in Hong Kong, which will lead to a lot of jokes. Cho Lam said: "Actually, I really wanted to make the drama similar to the classic "All's Well, Ends Well", where there isn't really one main character. I am confident "Come On, Cousin" can do it." Ivana Wong and Louis Cheung play two characters that use Wong Cho Lam and Mary Hon to enter the entertainment industry, but their fates are entirely different. Ivana Wong's career flies high, while Louis Cheung's career gets worse and worse. He even gets ridiculed by Wong Cho Lam, who makes him film a drama and dies 7 times in one day. Wong Cho Lam laughed saying the one in the drama who stands out most must be Louis Cheung, as he strips the most in the drama. Ram Tsang, "Meeting now, Need we have known each other before"
"Inbound Troubles" had a plot specially revolved around Ivana Wong's song "I Really Got Hurt. This time, Wong Cho Lam used Ram Tsang as a secret weapon, using Ram and Rita Carpio's classic song "Meeting now, Need we have known each other before". He uses Ram's story to say how people often fail in the music industry. In the drama, Ram plays a musician in dire strain who has to work at a funeral, Cho Lam said: "I've always admired Ram Tsang. I think he is just missing a representative role. Ram Tsang is one of the drama's hilarious parts." Besides this, the drama also has many guest stars, including Liza Wang, Kenneth Ma, Johnson Lee, Eric Kwok, Grace Yip, Hanjin, Kay Tse, etc. Most of he guest stars all appear in the plot that is related to the TV station, so they will play themselves. I'm excited. Can't wait for Monday. Hopefully this drama will not disappoint.